In a tapered metal design, this aged black floor lamp is topped with an open round cage shade design. 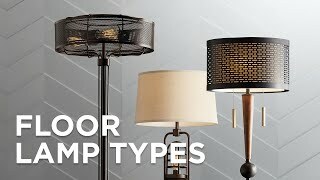 An industrial-inspired floor lamp in a tapered metal frame design. In an aged black finish accented with brushed brass plated details. Topped with an open round metal cage exposing the three bulbs. Design by Uttermost. 74 1/4" high. Base is 9 1/2" square. Weighs 28 lbs. Orb is 17 3/4" wide x 6 1/2" high. Uses three maximum 100 watt standard-medium base bulbs (not included). On-off foot switch on the cord. 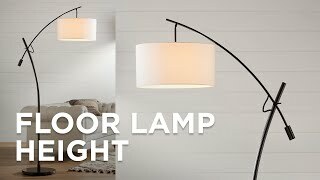 Palla floor lamp. From the Uttermost collection of lighting. Inspired by orb chandelier designs. Designed by Carolyn Kinder. Aged black finish. Brushed brass plated details. Metal round orb cage shape. Metal and cast resin construction. Where is the on/off switch for this lamp? Each bulb is 100w maximum or total of all 3 can be 100 (such as 3-30w)? BEST ANSWER: Hi - each socket can uses a maximum 100 watt bulb, so that's 300 watts in all. 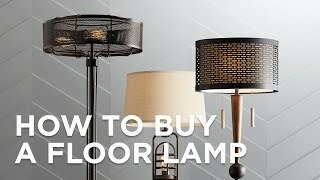 Will this lamp take standard chandelier bulbs (versus industrial style bulbs)? BEST ANSWER: Yes, this lamp can use any shape bulb with a standard/medium base as long as they are 100 watts maximum or equivalent each. Do all 3 lights have to be on or can you do one or two lights? BEST ANSWER: All three light will be on at the same time. Get a taste of charmingly casual design attitude with this fun black and antique brass floor lamp.